At the end of January 2008 a very strong storm system rolled through the Great Lakes basin. Temperatures dropped nearly 50 degrees fahrenheit (10 C) in just a few hours as the system pushed to the east. Very strong and steady winds from the east, gusting at times to 70 miles per hour (113 km/h), combined with the frigid temperatures to lead to dangerously low wind chill readings. As the storm surge traveled the length of Lake Erie it caused the water level of the lake at Buffalo to rise. TV and radio reported a rise of 10 to 11 feet (3 to 3.3 m). The United States Army Corps of Engineers recorded a more believable rise of 4.3 feet (1.3 m) in 12 hours. 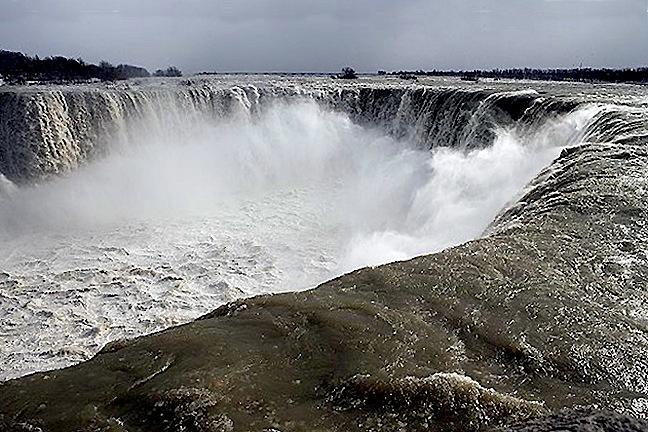 The volume of the Niagara River increased from an average of 202,000 cubic feet per second (5,720 cubic meters per second) to 262,353 cubic feet per second (7,429 cubic meters per second). This in turn caused the lake ice, held in place by the ice boom, to flow over it and into the Niagara River. The additional volume of water and ice resulted in flooding along sections of the Upper Niagara River. As a result the gates on the power dam upriver of the falls were all opened to allow the water to empty from the Upper Niagara as quickly as possible. This resulted in an impressive increase in the volume of water flowing over the falls. Here are two of photos of the Horseshoe Falls taken by Douglas Wilson the morning of January 31, 2008 at approximately 10 am. To see all of Doug's photos from that day click here. Enter niagarafalls in the name and password boxes. Also check out Doug's web site. By international treaty the average wintertime flow over Niagara Falls is 50,000 cubic feet per second (1,415 cubic meters per second). 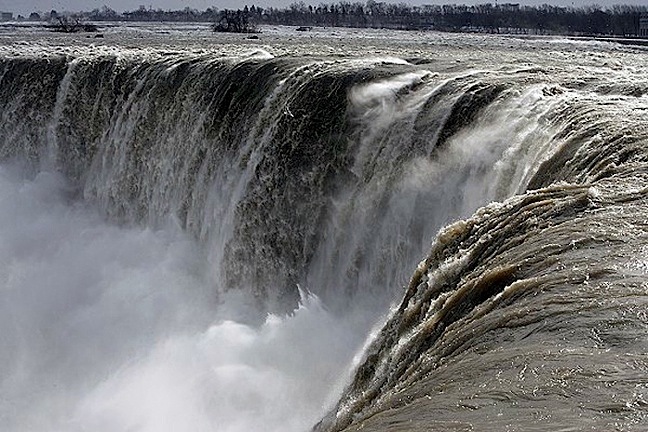 Assuming that the power plants were drawing off their full allotment of water, the volume passing over Niagara Falls on January 31, 2008 would then be around 110,353 cubic feet per second (3,125 cubic meters per second) or 10,353 cubic feet per second (5,720 cubic meters per second) more than the average summertime volume. Or to put it another way, an increase of 77,446 gallons per second (293,164 liters per second) from the summer time volume. The photo above was taken on February 03, 2008. It shows the ice conditions as seen from the American shore about three miles upriver of Niagara Falls. Another storm surge occurred in late December of 2008. The photo below of the American Falls was taken on December 28th. Warm temperatures a few days before caused rapid melting of the snow pack, causing the river level to rise. Strong winds from the east, gusting at times to 60 miles per hour (96.5 km/h) created a surge in the rivers volume. For comparison the photo below was taken in April of 2006. Note the change in the river’s width below the falls. 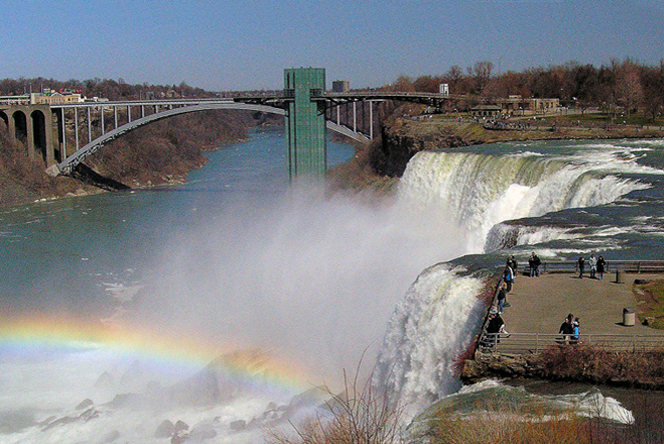 On December 27, 2008 at 4 PM the level of the Niagara River above the falls was reported at 561.7 feet (171.2 m). On the 28th at 4 PM the level rose to 563.6 feet (171.8 m). A change of 1.9 feet (0.6 m). 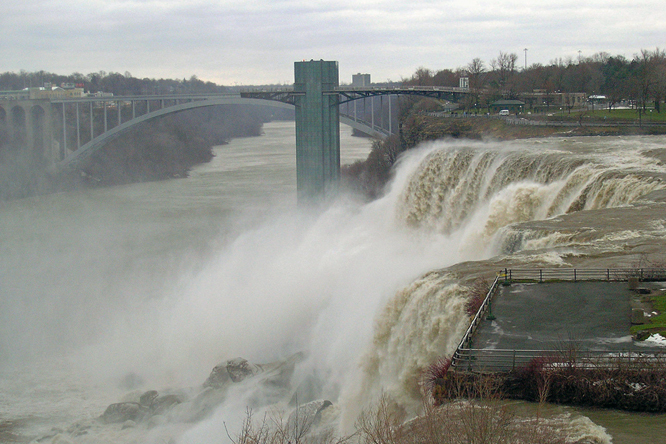 On December 27, 2008 at 4 PM the level of the Niagara River below the falls was reported at 320.3 feet (97.6 m). On the 28th at 4 PM the level rose to 338.6 feet (103.2 m). A change of 18.3 feet (5.6 m). The normal level for this time of the year is 316.6 feet (96.5 m). The summer time level is 326.4 feet (99.5 m). 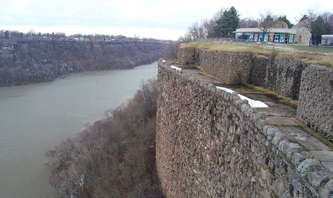 The large increase in the river level below the falls is caused by the narrowness of the gorge. Above the falls the river is 1.2 miles (1.9 km) wide. While below the falls the river is only 675 feet (205.7m) wide. For comparison the level of the Lower Niagara River crested at 341.1 feet (103.9 m) at 10 AM on January 30, 2008. The December surge was only 2.5 feet (0.7 m) below this. 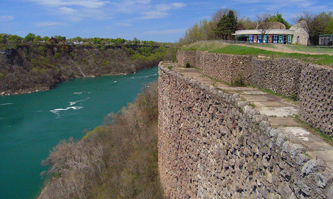 The two small photos below were taken from the overlook at the Niagara Gorge Discovery Center. The photo on the left was taken in May of 2007. The photo on the right was taken on December 28, 2008. The Horseshoe Falls on December 28, 2008. The American Falls and Niagara Gorge on December 28, 2008.